To celebrate the #Eddies this year I thought I would do my nominating both on my professional blog and on our NEW! Daring School Library Edublog! 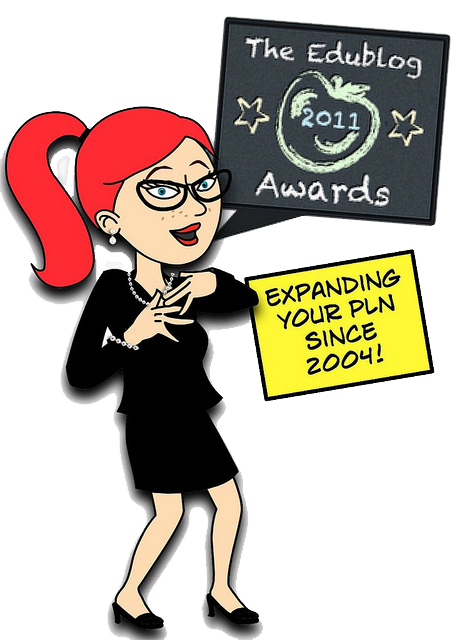 The EduBlogger award nomination process is a wonderful opportunity Pay it Forward by recognizing those in our PLN for their hard work and generosity. I wish I could name more than one on several of these categories! Gah! 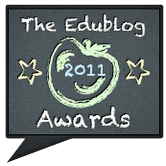 The Edublog awards has had a lot of buzz the last couple of years (both positive & hater) but I find the event & experience invigorating! I've been humbled & honored to be nominated a couple times (first by the amazing Shelly S Terrell! Thank you, Shelly!) and even came in second runner up once or twice! 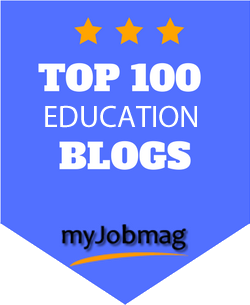 But what I get most from the Edublogs is an ever growing list of great new voices and views to add to my personal learning network. So, to practice what I preach about educational thieving, when I like something I STEAL IT! Here are my cribbed & adapted Edublog nominations! Heh heh heh! If you recognize something that looks familiar to something you nominated or wrote, I hope you're not mad & take it as flattery! 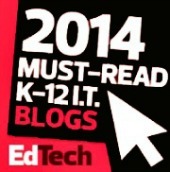 Best ed tech / resource sharing blog - Steven Anderson & his Web 2.0 Classroom blog. Honestly, sometimes people email me asking me how to do something & if I haven't blogged about it before before I write it up for them I check Steven's blog and Voila! It's usually there! Best individual blog Librarian by Day by Bobbi Newman fellow Libary Journal Mover & Shaker Bobbi Newman always has interesting information to share and a unique voice in the EdTech Librarian world! 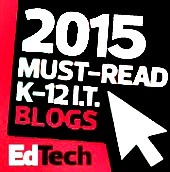 Best group blog http://denblogs.com/ I have to agree with Steve Dembo "the DEN Global blog is far and away the best group blogs in the EduVerse. Whether you grade based on quality, quantity, or value to visitors, our Leadership Council bloggers are doing an unbelievable job and absolutely deserve to be recognized for their efforts!" So I hereby nominate for the Best Group Blog! Best NEW blog: Tamara Cox – Eliterate Librarian She's another Geek Tribe shameless sharer and I LOVE that! She also was kind enough to leave a comment or two on this blog that were so spot on it drew me to her blog & I was hooked! Best individual tweeter: Shannon Miller Shannon Miller has a zest for the new, the challenging, and is a true change agent in her school, district, & community! She also is one of Cengage/Gale and SLJ's 5 national new library leaders program and a Shorty award winner! Her useful & positive Tweets brighten & inspire me! I also have to give mad props to Steven Anderson Seriously, the guy is a rock star! Best twitter hashtag- #tlchat, This is the hashtag that I always check to keep a pulse on library trends and news. I also like #EdChat a LOT! 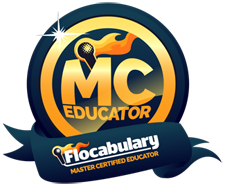 Best Educational Use of Audio/Video/Visual/Podcast Flocabulary @Flocabulary I've blogged about Flocabulary before but honestly, this has been one of the most relevant & incredibly enriching video resources in my school! Best Student Blog Hagan's World of Awesome @haganemiller - I'm not a little kid person...I admit it. I teach middle schoolers & find most elem kids well, a little whiny & annoying - but this kid is amazing! Sure, I'm a wee bit biased as he's the son of a friend but seriously - you gotta check out this blog! It's visual, upbeat, interesting, engaging, and very very AWEsome! Most Influential Blog Post #You Matter.....Two World-Changing Words @angelamaiers I am a huge admirer of Angela Maiers! She's positive, insightful, and oh so on point! The #youmatter movement - I'm totally behind it! 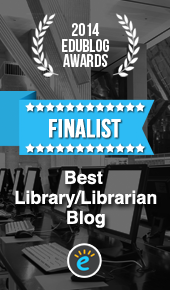 Best librarian / library blog- Adventures of Library Girl. 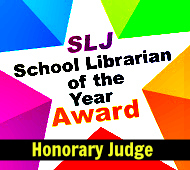 This is the toughest one for me EVERY YEAR because within my PLN there are so many wonderful librarian bloggers, but this year my nomination goes to one of my mentees Jennifer LaGarde's blog! She has consistently inspired me with her creative ideas and passion! Best open PD / unconference / webinar series: TL Virtual Cafe The TL Virtual Cafe is such an incredible FREE PD opportunity offered every month! Participating in this terrific webinar series has helped me to grow so much as a teacher-librarian and it always leaves me refreshed and full of new ideas. 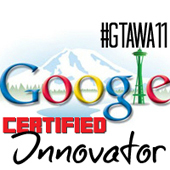 Our Geek Tribe is so giving… having so many willing to share makes for something really great! Best free web tool - Sweet Search for Students. Best educational Ed Tech Wiki: The Mighty Little Librarian's Tech Tuesdays. I love this series because it helps her teachers learn more about technology, improve their teaching, and advocates for her role as a tech leader in her school. All around a wonderful project. I always get great ideas from Tiff! I'm flattered she considers me a mentor but honestly, it's a lovely symbiotic relationship where she takes ideas from me & expands them into new fabulousness and I take ideas from her and get continuously inspired! Best open PD / unconference / webinar series- TL Virtual Cafe- my source for all the latest and greatest in the library world - now co-managed by Jennifer LaGarde & welcoming new moderators Librarian Tiff, Joquetta Johnson, & Shannon M. Miller! 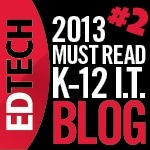 Best School Administrator blog: Eric Sheninger – A Principal’s Reflections Eric Sheninger is an inspiring administrator he's a super advocate for social media in schools. Lifetime achievement: Joyce Valenza Joyce is the queen of our Geek Tribe. She’s brilliant and inspirational. She’s an incredible leader and fabulous speaker. She is a shameless sharer and my official mentor. (I never get tired of typing that, right!?) Joyce is also kind, generous, and a great collaborator. With everything that she has done and continues to do to push our profession and education forward, she completely deserves to be recognized! - Nominate in as many categories as you want! - Nominations must be made somewhere public – your blog, a forum on a ning, a school website, etc. Thank you so much, sweetness. I feel like I've won something already. I'm lucky to have such an inspiring, encouraging tribe. Thinking of you and your family and sending happy thoughts your way. Thank you so much for including me! I'm so flattered that you think I'm worthy! What??? This is crazy talk! Thanks so much, Lovey! Like Tamara said, I feel like I've won something already! Big, big thanks!